The S&P 500 sold of 9.2% during December. So much for the Santa Claus rally?!?!? Luckily I had some solid cash flow/savings and a personal best for dividends to help buffer that drop in the market, but that only did so much. During December my net worth decreased $66,240.18. For December my net worth declined 11.5% which pushed the YTD change to -4.6%. Oooofff!?!?! That decline was much worse than what my investments showed during the month due to having to buy a new car. Unfortunately in early November I had gotten into an accident on my way to work (don't worry I'm 100% fine from it). I had to go looking for a new car since well, it doesn't take much to for a 10 year vehicle to be considered totaled. Luckily though I was paid roughly $3,900 for my vehicle by the insurance company which helped to fund the down payment for my replacement. I ended up going with a 2018 Hyundai Tucson. If I had more time to search for a vehicle and work on it myself I'd have gladly bought used; however, when I was looking at used Tucson's most of them were in the $18k range with 20k+ miles so I figured that I might as well just buy a new one with essentially 0 miles on it. I'm not too concerned about it though because the goal is to own this car for at least 10 years which I should easily hit assuming no random accidents. Taking on the additional debt for the new vehicle really hurt the net worth. Especially since I don't keep the "value" of the car on the books as an asset. Luckily the big hit will only come for December and then it'll be back to making steady, but slow progress until sometime between March and June. According to Kelley Blue Book my wife's car and my car are worth ~$40-45k combined. Our main financial target for 2018 is to pay down our non-mortgage debt and apparently by pay down the non-mortgage debt I meant take on more debt. That obviously wasn't the plan but man it feels like it's been 2 steps forward, 1 step back for the last few years. With new baby on the way we won't be prioritizing debt reduction until there's enough of a cash buffer to get us through the delivery and have an ample emergency fund in place. 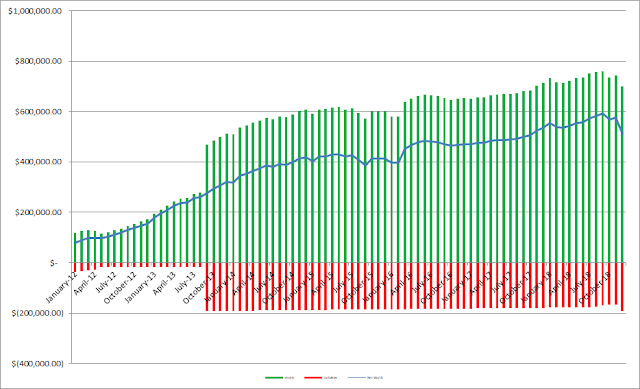 As of the end of December we have 27.2% equity in our house based on our purchase price from 2013. However, according to Zillow our house has increased in value around $30.4k from our purchase price which is a nice bonus, although I keep the purchase price as the value in the net worth equations. Based on Zillow's estimate the equity in our house jumps to 36.1%. Since I write so much (or at least try to) about investigating companies as an investment I figured it'd be fun to see how our balance sheet looks. 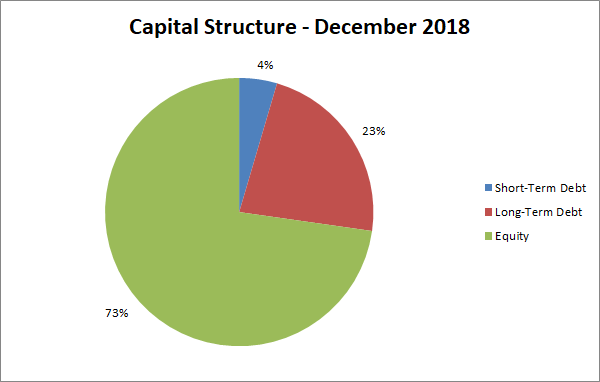 As of the end of December our debt to equity ratio is 37% and our debt to total capitalization is 27%. Not bad, but I can't wait to get that debt down to ZERO! 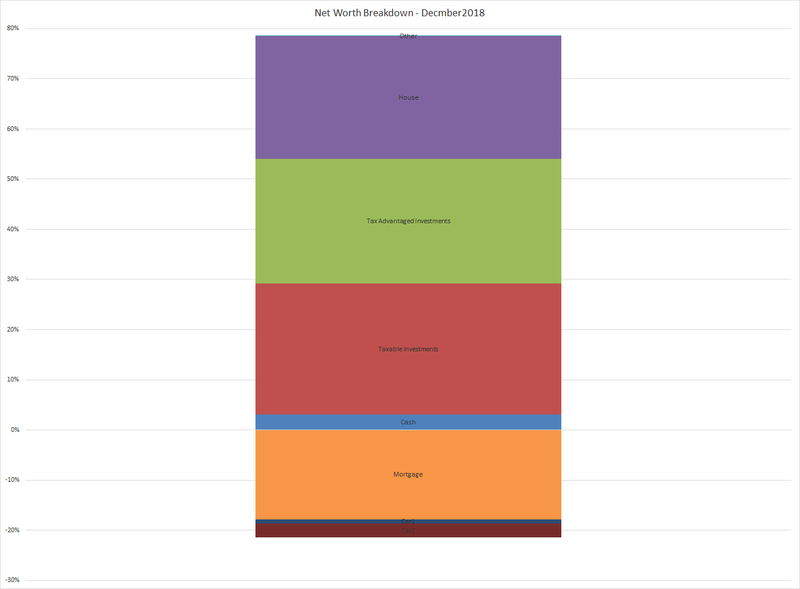 How did your net worth fare during December's stock market sell off? What about for all of 2018? I have been having trouble with just how correlated I am with the market recently as well. For 2019 my goal is to build up some non-correlated assets (gold and cash value life insurance) and pay down some debt. Non correlated assets will be good if you actually go through the process of rebalancing. I'm still a big believer in the US economy over the long term so the fluctuations might sting in the short run; however, in the long run I believe they will be worth more. Changes in between are just temporary. As long as my net worth is able to churn out higher cash flows more often than not then I'll be happy. Never fun to go backwards, but in the grand scheme of things, looks like a little blip in that net worth chart which will keep climbing upwards. Pretty well diversified asset holdings too which is good - hope it grows further in 2019. The big step backwards was a confluence of 3 major things. (1) the December Dump in equities, (2) having to purchase my new car and with $0 on the assets side and only liabilities from the note that stung a bit, and (3) I had noticed that I had my wife's vehicle on the assets in my calculation formula but took the asset "write down" all the way to $0. It hurt the balance sheet but I think it's the right way to approach this. Regarding 2019 I have no idea what's in store but if the markets are up then my net worth should be up, if they're down then my net worth will likely be down too. My focus is more on cash flow versus net worth. I track cash flow like a hawk. I assign $0 to our vehicle and assign a very conservative value to our principal residence and rental properties (I back out real estate commission and legal fees). 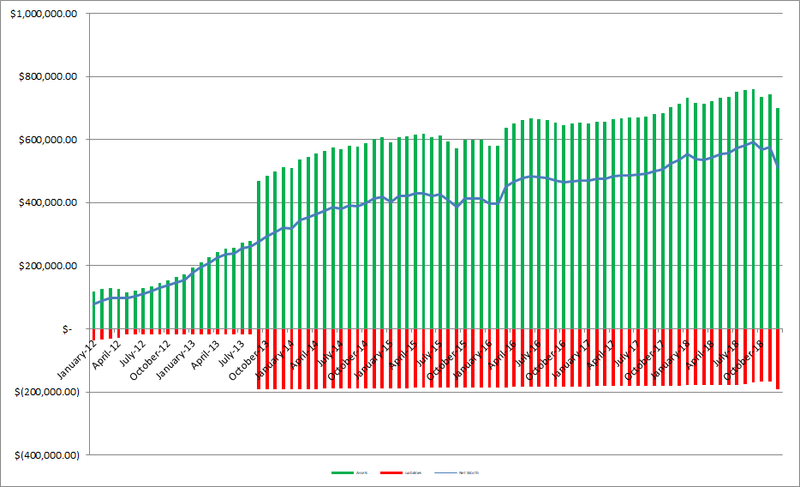 Quite frankly, I don't get hung up on the monthly change in value of our equity holdings. Stock prices go up, stock prices go down. I don't care because I don't sell. I rely on dividend and rental income to service our expenses during retirement hence the reason why I monitor cash flow very closely. I know my approach will change in a little over a decade when we will need to make mandatory withdrawals from our retirement accounts but for now....I actually want stock prices to drop. I note your comment about not making extra payments on your mortgage. Everybody's circumstances are unique but we decided to pay off our mortgage as quickly as possible because we knew that once our mortgage was paid off a huge weight would be lifted off our shoulders. Every payment we applied to our mortgage was definitely going to improve our cash flow that much faster. I couldn't say with 100% certainty that our cash flow was going to improve with every share we purchased in a high quality company. FYI - Buffett paid off his mortgage very quickly and he bought his house in a low interest rate environment. Owing NOTHING to ANYBODY makes a for a good night's sleep. I track my net worth but like you I'm much more focused on the cash flow that I'm able to generate from my investments rather than the absolute value of the net worth. I hope to eventually add some rental income but for now due to time and capital constraints it doesn't quite make sense to do so at this time. But it's something I've had my eye on for a while now. Eventually I do plan on paying down the mortgage at an accelerated pace. But for now I think building up the portfolio is the better play since we don't get the "relief" for our monthly cash flow by paying extra towards the mortgage rather it just cuts off the payments at the end. 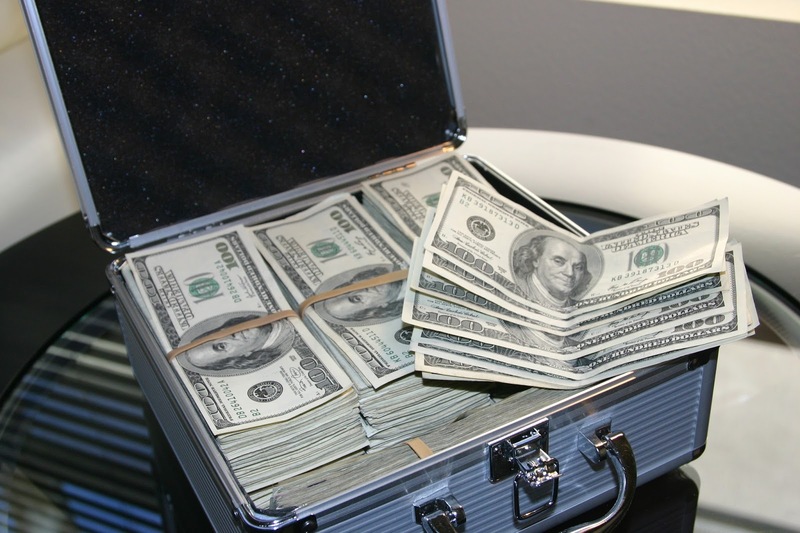 The idea is to get the portfolio to kind of a self-sustaining level to try and time the pay off of our mortgage with our dividends meeting our monthly spend less the mortgage payment. I'm sure we'll over or under shoot that target since there's a lot of variables in play; however, I think that will be the best strategy for us at this time. I can't wait to get to where we owe money to no one.